- Receive SMS with SMSBLASTER.COM web edition? Learn how it works! Receive SMS with SMSBLASTER.COM web edition? Learn how it works! If a mobile phone number was set as originator, answer SMS will be received on the mobile phone. Like this, SMS, received with the SMSBLASTER.CH web edition can be easily answered. Further advantage, incoming SMS are stored in the inbox and stay at your disposal. 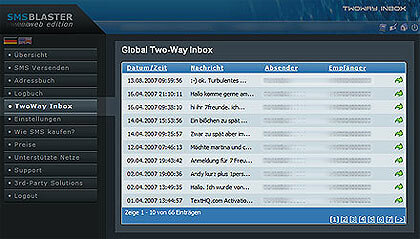 If you like an additional copy of each incoming SMS by e-mail, this can be easily configured, too. With the optional forward by HTTP get it is even possible to have incoming SMS processed by your application. Costs to send SMS to a Global Two-Way number: same like sending an international SMS, depending on your operator contract. value EURO 30.00 as a free present.